Homework and studying help from professional tutors. 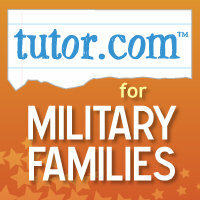 For military children, grades K-12. Students in US Army, Navy, Air Force, Marines, National Guard, Reserves, Wounded Warriors and deployed DoD civilian families are eligible for free access.